The traditional family structure of two married parents in one household is on the decline. And while the statistics show that around 60% of children live with two parents under one roof, less than half of children—around 46%—have a “traditional” family structure of two married, heterosexual parents in their first marriage. It’s clear that the idea of the modern family is evolving, but the data doesn’t account for the various family structures that currently exist. There is ample data that shows the percentage of children living with two parents under one roof versus a single parent, but that doesn’t include, or at least does not explain, the existence of two parents, living separately while both parenting their children. Co-parenting, or separate parenting, is when both parents share the responsibility of raising and parenting their children, but they do not live together. This specific family structure is becoming more common, even though recent census data shows about 23% of children live with a single mom, versus only 2% living with a single dad. The family dynamics involved in two parents with two households are complex and layered, just like every unique family situation. And while these arrangements come with their own specific set of challenges and hardships, there can also be a great deal of positivity and light that comes from two parents taking separate paths in order to be the happiest and healthiest people for their little ones. 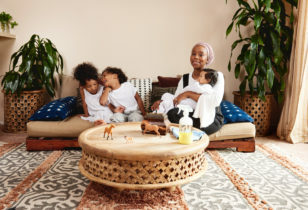 To shed light on a few of these families and get some co-parenting advice for folks also walking this path, we tapped five moms who are raising their children with a co-parent. Below, the mothers share their experience with the good, bad, ugly, and beautiful aspects that come along with parenting while apart. “My ex and I are both artists. I am a jeweler/gallerist and he is a sculptor. We were great collaborators when it came to establishing our creative lives and careers. 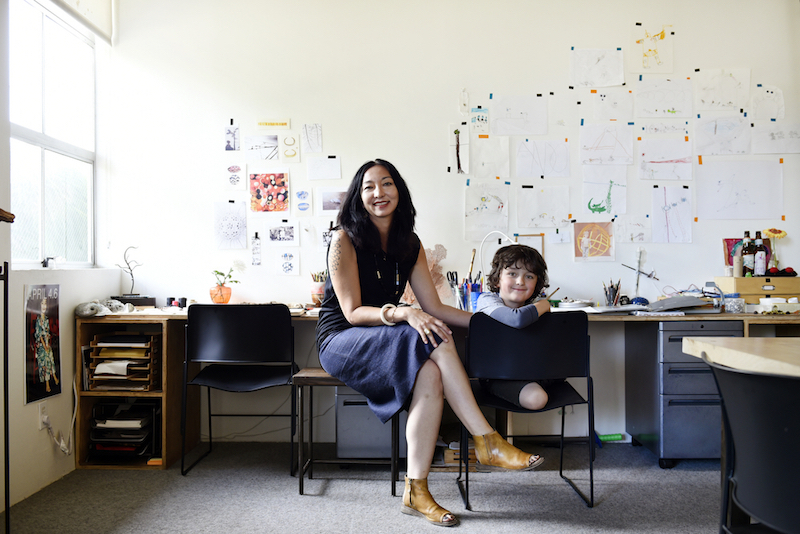 We both entered into parenthood on the late side and were used to having our downtime to be creative and run our businesses. We all know how much free time one has after having a baby (ha! ), and after our son was born we were thrown into the craziness of parenthood and both of us struggled a lot with how to balance work/life. When our son reached 3 1/2 we decided we needed to try something else and separated. During one of our separation fights, I heard my son yell down the stairs while in bed, ‘Daddy, don’t talk to my mama like that!’ From that moment on we knew that we had to do our best to not have him feel any tension about our separation. We went to therapy for months to discuss our issues and details of how we would separate. We would talk about all the hard things there with a witness to help facilitate and moderate our discussions. In the end, we were not mean to each other. Because of our commitment to minimize any tension in our separation, we were able to be respectful to each other around our son. We had weekly breakfasts with our son at hand-off in those first years and used this time to catch up with parenting things that had happened during the week. We still continued to share our parenting friends and community and none of them ever had to choose between us as friends. Dating someone new on each side has been a challenge and adjustment, especially when your ex starts to date someone new and you have to share your child with another woman. It’s hard enough to lose your husband, but then to think that you have to share your child is heart-wrenching. I think as long as everyone is respectful you can get over that, but that was a huge thing for me to deal with. I think going slow in any new relationship is healthy and gives everyone time to adjust to new patterns and people. For me there is no rush after a long-term marriage. I’m really happy my new life has slowly evolved and given everyone time and space to find their place in all of it. By coincidence, I met a man who also has an 8-year-old son and we have been happily together for a few years. Our boys get along really well. We have maintained two houses. I have time to myself. Time alone with my son. Time with my boyfriend solo. And then we can all get together with our boys and do sleepovers twice a month with our blended family. It really is like having it all without feeling guilty one bit. I’ll still grab a coffee with my son’s father to check in and discuss events in our son’s life. It’s definitely a ‘modern family’ situation. “I think it’s important to be honest with your kids in a way that’s easy for them to understand. If you talk to them honestly, they can better express their emotions around what they feel and see and experience. Co-parenting comes with many different perspectives, stories, and experiences. For us, we’re best friends and we have a daughter together. We were together for a long time. We decided we’d be happier apart, but a child bonds you for life—longer than any wedding vow or ring will. We love each other deeply and have each other’s back 100%. We have that mutual understanding and respect for each other, so this comes easy for us. In a situation like ours, we’d say to be respectful, be honest, be communicative, be fair, keep each other fully engaged and consider how the other person feels. It’s a lifelong bond and we treat it as such. And my advice to everyone in everything is to focus on the positive and the opportunities for doing better. Dwelling on negativity—whether towards your former partner or child’s parent—won’t help you, or the relationship, or your child. Be focused on moving forward and doing better, always. Before the transition from one house to another, we talk about it. It helps my daughter to know what’s coming, and for how long. When she was younger, we had a calendar where we’d mark the ‘dad days’ and ‘mom days’ and do a visual countdown. Now we just set appropriate expectations and make sure to communicate plans. She has favorite clothes and toys at each. Sometimes we swap things between the two. A lot of people believes it’s easier and happier to co-parent and it so great to be able to have weekends free. But that’s a grass is greener perspective. It’s still hard, for a bunch of reasons. Being a solo parent is hard. And you actually miss your kid on the weekends. I think a lot of people have a hesitation around the idea of ‘co-parenting’ based on preconceived notions or these traditional expectations of a two-parent household. They’re worried what family may think, what other friends and parents may think, but in reality, you’re the one in charge of your life. You pursue your happiness. The people who love you will support you. And most of the world doesn’t bat an eye when you tell them that you’re a ‘co-parent.’ Instead, they start seeking your advice. I have found the people in ‘traditional relationships’ are quite unhappy and are looking for someone to help provide advice and guidance. Societal expectations and realities are changing. Roles are changing. Households are changing. It’s not so strange anymore. “I left my husband when I was 6 weeks pregnant with our second child. He stayed in Georgia, where we had been living, and I moved to Colorado and raised both of our kids with the help of my family for three years. My ex saw the children about four times a year for a few days each time. I was responsible for making all of the parenting decisions for the children. When our second child was about to turn three years old and our oldest was almost five, my ex-husband moved to Colorado. At first he looked to my parenting style and tried to match what I was doing. He was only seeing the kids about once a week. My ex eventually remarried and any co-parenting that was happening disappeared. If something happened at their house with the children and I brought it up to them, it resulted in vulgar language and being shut out of any form of communication. Because of the situation my children are in, they have learned more about relationships than most adults have learned. They have learned they do not have to like someone to be nice to them. They are currently learning how to be assertive and advocate for themselves in different situations. How to have a voice and prevent people from taking your voice away. I’ve been surprised by how much this situation has pushed me to have a relationship with my children that I had only dreamed of. We are very open and honest with our feelings, thoughts, fears, and goals and communicate our needs to each other. I think TV and movies can make co-parenting look hip and easy. Parenting of any kind is not easy. Every parent makes mistakes and it is important to learn and grow from your mistakes. I have seen co-parenting be successful and I have experienced it fail or not exist. Take it one step at a time. It is best to be hopeful. Hope for the best, plan for the worst. However, no matter what your parenting situation turns out to be, make sure you remind your kids every day that you love them and show them daily that you love them. And find comfort in the fact that they may have more parents than the traditional nuclear family, but that is just more people to love them and help them grow. “We share a family home and so we take turns rotating out of it. Right now, we switch off every other night. That might seem hectic to some people, but for us, it works. We both get to see our daughter every day and her life has been disrupted as minimally as possible. We both know it’s not a long-term solution, but while we make the transition, it’s been the best thing for us. One of the biggest positives of our co-parenting arrangement is the alone time. Because I’ve always worked full-time, I had a lot of guilt when my daughter was young. I felt like I had to spend all my time outside of work with her. I love her more than anything in this world, but those moments that I get now to take long walks, sleep in, see live music, spend time with friends, have changed my life. Also, the 1-on-1 time I get to spend with her. We took an 8-night trip to Sante Fe together this summer, just us, and we really got to know each other in such a different light. It’s also been super positive for her to see me happy. Kids get it. They are resilient and compassionate humans. “Things started off really rocky in my co-parenting journey. My ex-husband and I divorced when my daughter was 18 months old. I was really afraid and angry at him for a lot of very legitimate reasons for a long time. We were in the court system for almost three years, needing mediators to make important decisions for us. It was brutal. For quite a few years, we parallel-parented rather than co-parented, where each parent does their own thing with minimal interaction because they simply can’t agree on anything. At that point, I was really hopeless that we’d ever get to a positive place as co-parents. Every conversation was an uphill battle and had to be done via email. Around that time, a friend who is a co-parenting veteran told me, ‘One day, you guys will get along fine and you’ll be able to accept him for who he is.’ My reaction was so certain: ‘This is different. You don’t know what it’s like to divorce someone like this. He is different and it will never get better.’ So, I think the biggest surprise for me is that she was right. It took us five years, but we have gotten to the point where not only are we able to make decisions about school, schedules, medical issues, and money without involving the court, but we are also able to share a meal together for the benefit of our daughter. Everyone always says, ‘put the child first.’ That is 100% necessary and also so much harder than you expect it to be. It requires incredible self-restraint and talented acting. In front of my child, it was all sunshine and rainbows. Like a mantra I’d repeat, ‘You got all the best parts of Mommy and all the best parts of Daddy. We are SO lucky to have made you.’ I’d also sing the praises of her step-mom, who at the time I’d had only one interaction with (and it was less than positive). For those of us that are Type A and want to ‘fix’ things right away. We have a hard time seeing the long game, and it’s hard to be patient with the process. People either expect to be good at co-parenting right away, or they expect it to be a horror show forever. The reality is probably somewhere in the middle, and getting to that point takes time and a lot of faking-it-until-you-make-it. I spent about four years faking it until I finally made it. Now I can honestly say that my daughter got the best parts of both of us. It’s totally true. And I am endlessly grateful to her step-mom, who, as it turns out, is an incredible support to my sensitive child. She and my ex now have a son together, who my daughter loves. It is a beautiful thing to watch her as a big sister, and surreal to know that my daughter and I met him in the hospital before his own grandparents did. We are truly a modern family. This is not to say that things are perfect; we divorced for a reason, and some of the personality differences we have still cause problems. However, I learned a lot about how to handle these issues by seeing an excellent child therapist, and I feel really confident about how I parent through these challenges. Our schedule has varied over the years; when we split my daughter was still breastfeeding and had a lot of anxiety about being away from me, so there were no overnights. Now we’re essentially on an every-other-weekend schedule. Holidays and special occasions are split evenly and were outlined in our divorce settlement. As time has gone on, we’ve been able to be more flexible with switching weekends, too. The change in routine isn’t always easy on our daughter, but sometimes it’s necessary. This last year I had breast cancer and ended up leaning on my ex and his wife to help give our daughter a happy space while I recovered from surgeries. 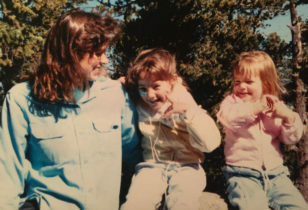 To read more on this topic, check out one mother’s touching story about parenting from a distance, a first-person “Mom Talk” essay about the challenges of co-parenting and our profile on co-parenting mama Domino Kirke.